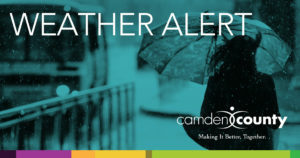 (Lindenwold, NJ) – The Camden County Department of Public Works (CCDPW) is closely monitoring a storm system that could bring severe thunderstorms, wind gusts and hail to our area this afternoon. Rain beginning this evening will become heavier toward morning as a strong low-pressure system develops offshore. As this is happening, it is creating and drawing in colder air with “wrap-around” precipitation that moves back into the area during the day Friday. There is a chance for snow to be added into the mix tomorrow afternoon and evening, but we are not expecting anything more than a coating on nonpaved surfaces. Wind gusts of up to 50 miles per hour could lead to some downed trees and power outages. Residents are encouraged to drive with caution and avoid low-lying areas where flooding is known to occur, and avoid any downed power lines. At the public works complex in Lindenwold, a fleet of about 100 vehicles stand ready to keep Camden County’s 1,200 lane miles of roadways passable. As always, please use 911 for emergencies only. If you see a problem on a county road, please call our 24-hour hotline at (856) 566-2980 to report it to CCDPW.